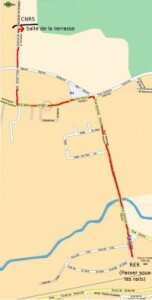 The CNRS campus in Gif-sur-Yvette can be easily reached either by road or by RER (please see the maps plans). Take motorway N118, follow the signs Porte de Saint-Cloud, then the signs Pont de Sèvres, Nantes, Bordeaux. 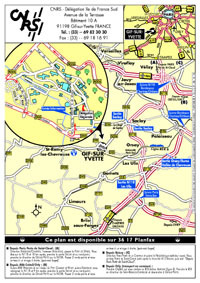 Then go in direction of Vélizy, take the exit to Saclay or Bures-sur-Yvette. Follow the direction Nantes-Bordeaux, then exit at Orsay-Bures. By RER B (Station Saint-Michel Notre Dame, or Luxembourg) exit at the train station Gif-sur-Yvette (about 40mn). Cross the train tracks by the tunnel and follow the street “rue de la croix de Grignon”, make a left in the street ” rue Alphonse Pecard”, then a left in “rue Henri Amodru”, then a right in “rue Emile Thuau”, until you find “Avenue de la Terrasse” straight ahead. The best is to arrive through the TGV station in Massy Palaiseau. If you arrive at the TGV station in Massy Palaiseau, please exit from the TGV station and go to the station of RER in Massy-Palaiseau situated at 50m. Take the RER B (Direction Saint-Rémy-lès-Chevreuse), exit at the station Gif-sur-Yvette (about 25mn). If you arrive at Gare de Lyon in Paris, take the RER A (Direction St Germain en Laye), take the connection at the station Chatelet les Halles, take RER B (Direction Saint-Rémy-lès-Chevreuse), exit at the station de Gif-sur-Yvette (environ 40mn). By foot, follow the street “rue de la croix de Grignon”, make a left in the street ” rue Alphonse Pecard”, then a left in “rue Henri Amodru”, then a right in “rue Emile Thuau”, until you find “Avenue de la Terrasse” straight ahead (about 10 mn). Take OrlyVal to Antony then RER B direction Saint-Rémy-lès-Chevreuse (about 1h). Take RER B direction Saint-Rémy-lès-Chevreuse (about 1h30).